For my two Thanksgiving appetizers on Thursday, I made a big batch of cranberry relish and I used only about 1/3 of it for the baked brie. The relish was so good though that I wanted to use it for a brunch dish. I came up with the idea for making some cheese blintzes and then slathering them with the tangy cranberry relish rather than syrup or something like that. This plan of mine worked better than I expected. Cranberry cheese blintzes are something you should make. 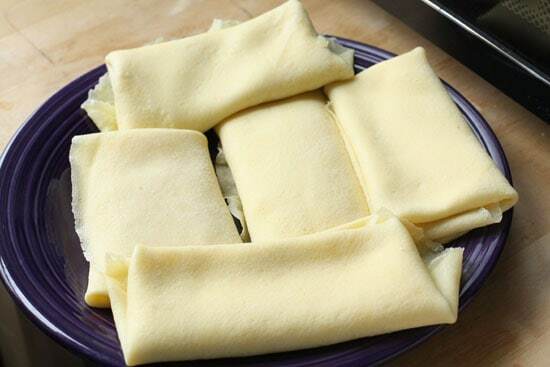 If you haven’t made blintzes before, they are very similar to crepes. The batter is almost identical, it’s just a bit more eggy and therefore it produces a sturdier pancake. It’s a very small difference though. Delicious and simple Cheese filled blintzes with cranberry sauce on top. 1) Combine flour, milk, eggs, and butter in a large bowl and whisk together. 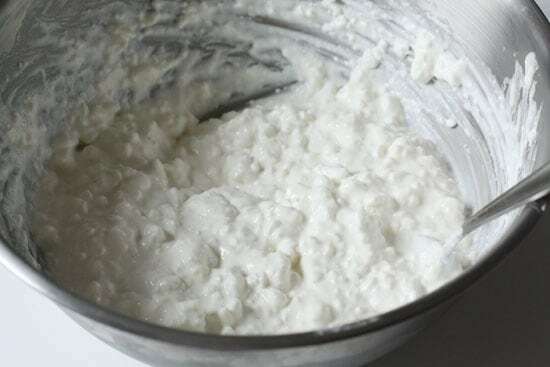 Let sit for 24 hours in the fridge if you make the batter in advance or a few minutes if cooking immediately. 2) Heat a large nonstick pan over medium heat with a small knob of butter (or use nonstick spray) in it. 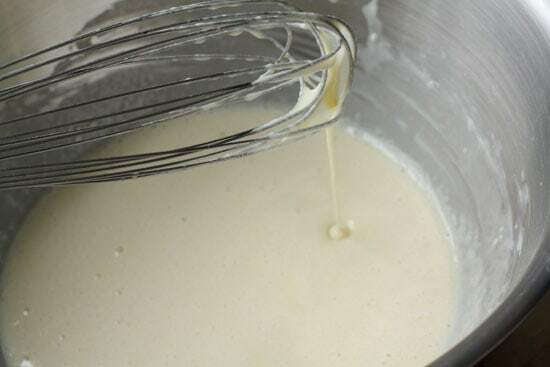 Once the butter is well melted and hot, add about 1/2 Cup of batter to the pan and swirl it around so the batter covers the entire bottom of the pan. After about 15 seconds, it should be pretty dry. Then give it a flip using a spatula to help out. 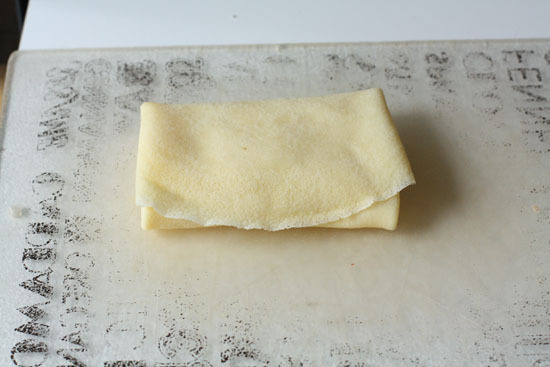 3) Cook for literally 15 seconds on the other side and then take that blintz off and set it on a plate. The blintz shouldn’t be crispy at all. It should be nice and flexible. You can immediately add more batter to the pan and keep going! 4) Mix cheeses, sugar, and cinnamon in a bowl. It definitely helps if you start with your cream cheese at room temperature. 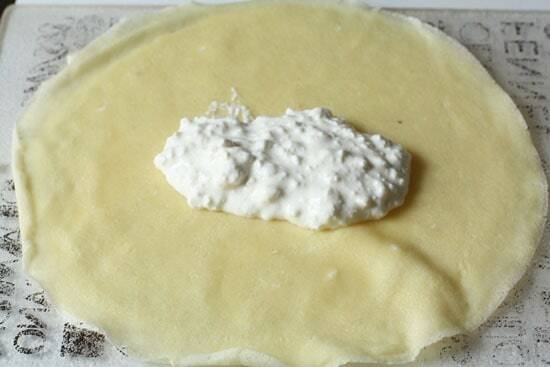 5) Grab a blintz and put about two tablespoons of filling on it. 6) Fold in the ends so they slightly overlap. Roll up the other two ends until you have a nice little package of deliciousness. 7) To cook, you can do it on the stove or bake at 400 degrees with a bit of butter and sugar on top for 10 minutes. Spray baking dish so they don’t stick! If using stovetop method, add a bit more butter to pan (1 Teaspoon is more than enough) and once it is melted, arrange blintzes in the pan. You can fit as many as possible, but just make sure they aren’t overlapping at all. Let them cook for a few minutes on one side and then flip them over. They should be slightly browned and crispy! 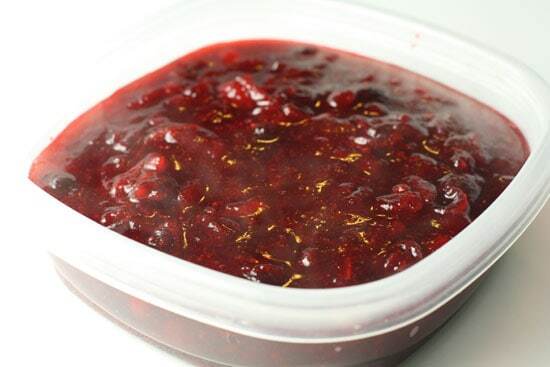 8) Warm cranberry relish up in microwave. 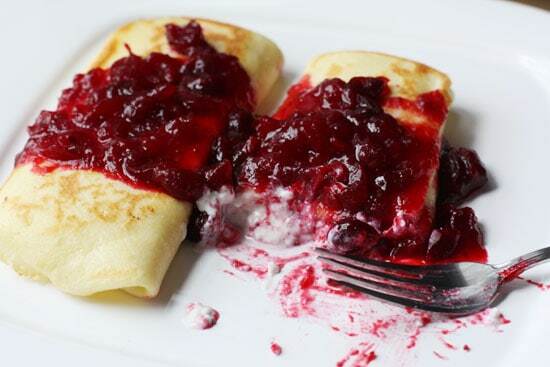 9) Serve the blintz with a bunch of the cranberry relish! I’ve made crepes before on Macheesmo (although it was awhile ago). These guys are basically the exact same. Start by making your batter by combining everything in a large bowl and whisking it all together. It will be really runny. You can let this sit for an hour to 24 hours in the fridge so you could make it the night before. I just let mine sit for a few minutes though and it worked fine also. Start heating a large nonstick pan over medium heat with a small knob of butter (or use nonstick spray) in it. Once the butter is well melted and hot, add about 1/2 Cup of batter to the pan and swirl it around so the batter covers the entire bottom of the pan. After about 15 seconds, it should be pretty dry. Then give it a flip using a spatula to help out. Cook for literally 15 seconds on the other side and then take that blintz off and set it on a plate. The blintz shouldn’t be crispy at all. It should be nice and flexible. You can immediately add more batter to the pan and keep going! If you mess up the first one, don’t worry about it. It usually takes one or two to get the method down. Eventually though you’ll end up with a plate of lovely blintzes! Not rocket science people. Mix your cheeses, sugar, and cinnamon in a bowl. It definitely helps if you start with your cream cheese at room temperature. 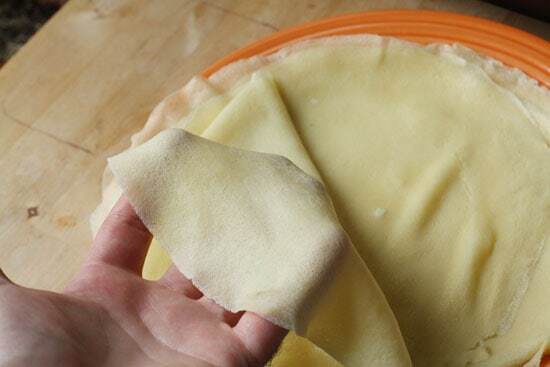 Grab a blintz and put about two tablespoons of filling on it. You can do more if you’re feeling lucky. Next, fold in the ends so they slightly overlap. Then roll up the other two ends until you have a nice little package of deliciousness. The nice thing about these is that there is no rush to finish them. Take your time and just set aside each blintz as you make it. If you roll them correctly they should be pretty sturdy. If I’m just cooking for a few people, I finish these on the stove, but if you are cooking a bunch of these (like a double batch or something), you can also bake these in a 400 degree oven with just a bit of butter and sugar on top for 10 minutes. Just make sure to spray your baking dish so they don’t stick. 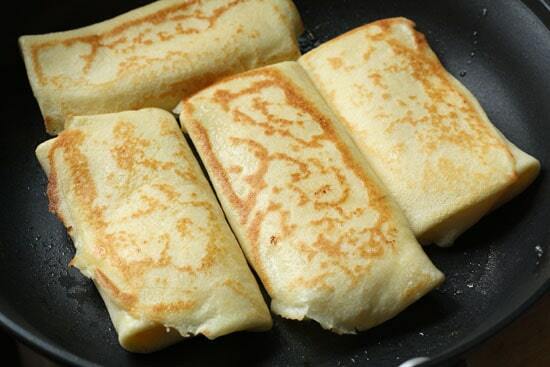 If you are doing it on the stovetop though, add a bit more butter to your pan (1 Teaspoon is more than enough) and once it is melted, arrange your blintzes in the pan. You can fit as many as possible, but just make sure they aren’t overlapping at all. Hopefully, you’ve made your cranberry relish already. Again the recipe that I used is from my Thanksgiving appetizer post. I just microwaved mine for a few minutes until it was warm. You could of course just use store bought stuff for this. Any kind of jam at all would be great. Heat this up for a few minutes. I think you know the rest! 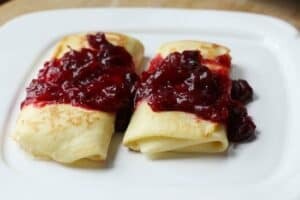 Serve the blintz with a bunch of the cranberry relish! These actually aren’t as rich as they look. The filling isn’t all that sweet and the relish is kind of tangy. I think these are actually way less rich than a stack of pancakes and they do have a certain holiday flare to them. You could obviously go crazy with the toppings and fillings, but this is a great base recipe. Blintzes are on my top-five list of favorite foods, but I never thought about serving them with cranberries. Good idea! they look great. Can they be oven baked too??? At Shelly, you can definitely bake them in the oven. 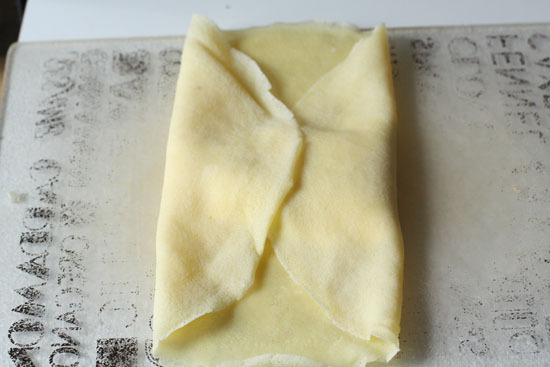 There’s some instructions how to do so now in the Finishing the Blintzes section. Also in line with the blog's recent theme of Slifka-appropriate Thanksgiving recipes. I like. Greetings Nick. I've been lurking for weeks, but finally decided to comment. (It could be flood gates now. Look out!) Actually, I have just spent some seriously rare free time (after kids are in bed for the night) perusing your blog. Actually, I did this last night, too. You should feel very special ;-) I swore I wasn't going to follow another food blog…then there you were, with your great recipes, beautiful pictures, and charming Tweets. Damn you. Anyhoodle, these Blintzes bring back such fond childhood memories and I thought it was a good place to stop, for fear I might be on your blog for another hour and then not get the desperate beauty sleep I need. I am loving this picture and am totally salivating over here, which means I'll probably eat something right before bed that isn't good for me at all. But I digress. Love your site. And I don't just say that to everyone. For real.